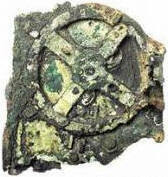 The Antikythera Mechanism is a geared, mechanical calculator that was built by the Greeks around the end of the second century BC. It is named after its place of discovery in 1901 in a Roman shipwreck off the Antikythera islands. The mechanism is technically more complex than any known device for at least a millennium afterwards. Its functionality remained a mystery for nearly a century because of the encrusting by barnacles. Finally, in 2005, high-resolution X-ray tomography of the surviving fragments enabled researchers to reconstruct the gear function and decipher many of the surface inscriptions, which assisted in determining the device's functions. The mechanism predicted lunar and solar eclipses as well as orbital motions of all the known planets of the day (through Jupiter) and the Earth's moon. The front dial is marked with the divisions of the Egyptian calendar. Inside this there is a second dial marked with the Greek signs of the Zodiac. This second dial is moveable dial so that it can be adjusted to compensate for leap years.